Loving Care Pet Products Ultra Supreme Crate, Kennel or Cage Mat, Dog Mat, Pet Mat, Cat Mat. Heavy Duty Materials and non-slip bottom. Water resistant. 5 to suit most pets. Our Ultra Supreme Crate Mat is made from the same durable superior materials as our Nesting Beds B01ITT32SU and Loungers B00XCC3KXM. Water, Urine and Oil Resistant. Non-Allergenic Materials. Durable, Cool, Easy-care, Wipe-off, HEAVY DUTY Polyester coated with DuPont Teflon. Non-Skid Bottom Base. INDOOR OR OUTDOOR USE. 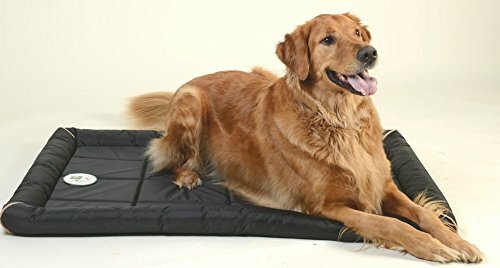 When your pet wants to be near you in the kitchen or office, our Lightweight MAT is an easy option for your best friend to rest near you. Perfect for Baby Change Mat as non-slip and pillowy edge for comfort, . Adds comfort to pet’s crates or cages. Perfect to bring along to the Vet’s Office. Our Mat is durable, easy clean and waterproof which makes it a perfect option to bring along to the beach, festival, picnic or to a sporting event for owners to enjoy also.